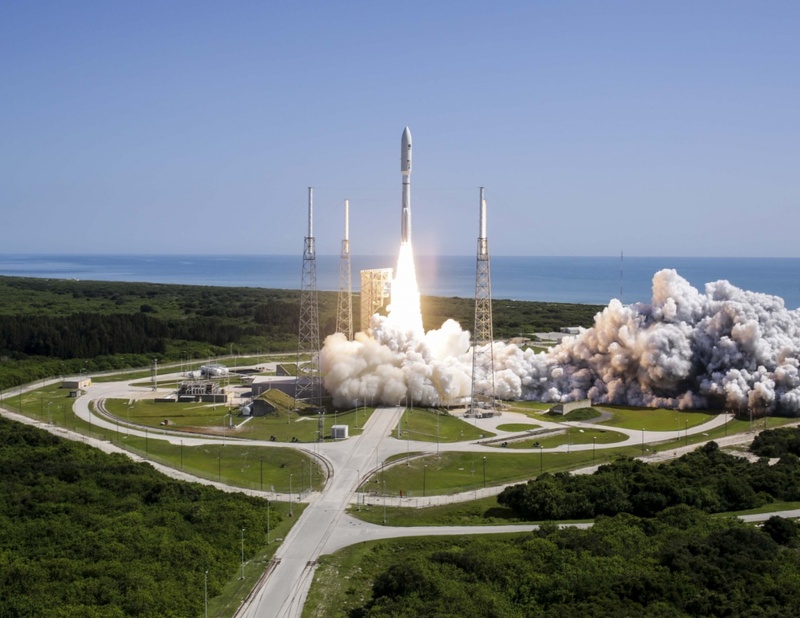 July 8, 2016 – The fifth Mobile User Objective System (MUOS-5) satellite, which successfully launched aboard a United Launch Alliance Atlas 5 on June 24, experienced an anomaly that required movement to its targeted orbit to be temporarily halted. Built by Lcckheed Martin, MUOS-5 was projected to reach its geosynchronous orbit and enter its test location 22,000 miles (37,586 km kilometers) above Hawaii by July 3. No details about the anomaly have been released, but according to a press release, the Navy’s Program Executive Office for Space Systems has reconfigured the satellite from orbital transfer into a stabilized, safe intermediate orbit to allow the MUOS team to evaluate the situation and determine options for proceeding. MUOS-5 was launched as an on-orbit spare to provide immediate redundancy to the MUOS constellation, which is performing nominally. MUOS-5 is an on-orbit spare, and delay in reaching its test location will have no impact upon current legacy or Wideband Code Division Multiple Access satellite communications operations. MUOS-1 through MUOS-4 are now in orbit and supporting operations via their legacy payloads that provide ultra high frequency satellite communications for the Department of Defense. MUOS is a network of orbiting satellites and relay ground stations that is revolutionizing secure communications for mobile military forces. MUOS’ new smart phone-like capabilities will provide safe and secure communications across the globe, through rough terrain and extended communications reach to the Polar Regions. MUOS’ capabilities include simultaneous, crystal-clear voice, video and mission data over a secure high-speed Internet Protocol-based system. The Navy’s Program Executive Office for Space Systems, located at the Space and Naval Warfare Systems Command in San Diego, is responsible for the MUOS program. Lockheed Martin assembled and tested all five of the MUOS satellites at its Sunnyvale, California, facility. A Lockheed Martin-led team, stationed at Naval Base Ventura County, Point Mugu, California, is operating the satellite from its transfer orbit to its test slot.